^ Ball, W.W. Rouse. A Short Account of the History of Mathematics 4th. New York: Dover Publications. 1960年: 第50至62頁. ISBN 0-486-20630-0. ^ Boyer, Carl B. A History of Mathematics 2nd. John Wiley & Sons. 1991年: 第100至19頁. ISBN 0471543977. ^ Proclus; Glenn Raymond Morrow. 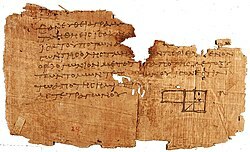 A Commentary on the First Book of Euclid's Elements. Princeton University Press. 1992: 88–. ISBN 0-691-02090-6. ^ The MacTutor History of Mathematics archive. ^ Conic Sections in Ancient Greece. ^ Jean Itard. Les livres arithmétiques d'Euclide. 1962. 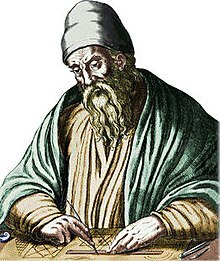 Euclid (Greek mathematician). Encyclopædia Britannica, Inc. 2008年 [2008-04-18]. Artmann, Benno (1999). 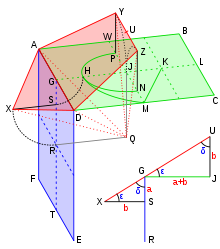 Euclid: The Creation of Mathematics. New York: Springer. ISBN 978-0-387-98423-0. Heath, Thomas. The Thirteen Books of Euclid's Elements vol.1. Dover Publications. 1956年 [1908年]. ISBN 0486600882. Heath, Thomas L. (1981年). A History of Greek Mathematics, 2 Vols. New York: Dover Publications. ISBN 978-0-486-24073-2 / ISBN 978-0-486-24074-9. Kline, Morris（1980年）. Mathematics: The Loss of Certainty. Oxford: Oxford University Press. ISBN 978-0-19-502754-9. Struik, Dirk J. A Concise History of Mathematics. Dover Publications. 1967年. ISBN 0486602559.